I remember Persuader well as a plot, but not the details. In this one Reacher is outside a college, pretending to load books in a van. He sees an attempted kidnapping of a kid, the bodyguards blown up in their car with a grenade as the kidnappers try to escape. He steps out and stops them, but kills a cop in the process. The kid and Reacher escape, and the kid convinces Reacher to take him home, up in Maine, to their house, which is a compound on the water. Apparently the kid was kidnapped years ago and the father got him back, but keeps him protected. It's a bit shocking, but the story unwinds. 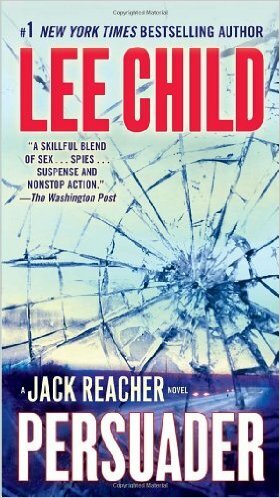 Reacher saw a man he thought he'd killed in the Army. A man that was supposed to be arrested, but killed two MPs. The story flashes back here and there, letting us see some of Reacher, the MP. Meanwhile, he's partnered with the DEA, trying to find out what is happening and tracking a missing agent. The whole thing is off the books. It's a wild ride, just a few days, but quite a series of adventures, where we never really know what's going on for most of the book. However there is a dramatic finish near the end, but the book then just winds down.